A previously-unreleased sweet soul treasure – now finally getting its due! 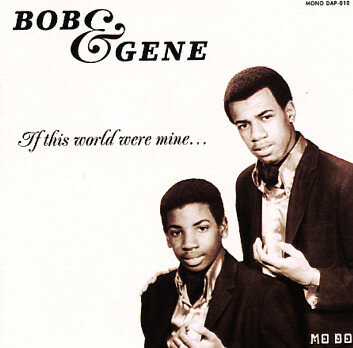 Bob & Gene were an obscure duo from Buffalo at the end of the 60s – recording briefly together under the guidance of Bob's father, who recorded the young pair in his home studio with the help of some great funk and soul musicians from the local scene – with a sound that's fresh, fragile, and deeply personal. Many numbers have a slow, sad quality that's right up there with some of the best harmony soul of the time – a wispy late nite kind of sound that's captured perfectly here, with just the right balance of roughness and sweet. Other numbers get a bit more upbeat, and almost a bit funky – showing the pair to have a bit more punch than some of their contemporaries, and a sometimes sunny sound that really sparkles amidst the darkness. Most of the work here was recorded in the late 60s, but never released – making this the first-ever album by the group. And as a bonus note of trivia, Bob here is none other than Bobby Nunn – who went onto record under his own name, and did a lot of great work in the LA scene of the 70s! Titles include "Gotta Find A Way", "Your Name", "It Won't Go", "I Can Be Cool", "Sailboat", "Interlude", "Which Love", "Don't Leave Me Girl", "You Gave Me Love", and a great cover of "If This World Were Mine". Includes the bonus tracks "It's Not What You Know" and "I Really Love You". © 1996-2019, Dusty Groove, Inc.